No longer are overpowering, smelly deer and animal repellents needed to effectively protect your garden areas. In the past, the worse something smelled, the more confidence our customers had in a particular animal repellent. However, there are many different scents and tastes that will deter deer and other animals from your garden... and we suggest that you try them! We think that you will be impressed with how well they work. Here are some of our favorites.. 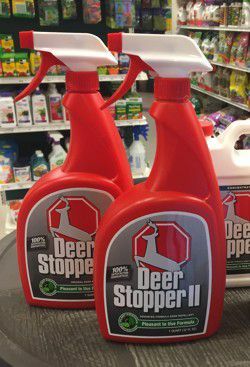 Deer Stopper products from Messina Wildlife: These liquid spray products are actually made in two formulas: There is the original Deer Stopper I formula, which has a rosemary and mint override, and then there is Deer Stopper II, which has a cinnamon override. We often suggest rotating between the two scents so that deer never get too comfortable with the scent. These atypical scents mask the natural plant odors that deer are familiar with and as a result, they will not think of it as food. Don't worry though, even if deer were to take a nibble, both of these products still have egg solids in them to make plants taste disgusting. Critter Ridder: This product is great for smaller rodents such as raccoons, groundhogs, squirrels, chipmunks and more. The peppery scent in this product has been around for many years and it is a "tried and true" formula. The pepper aggravates small rodents and makes them flee areas where Critter Ridder is applied. The product has no overwhelming scent to humans and is safe to use around vegetable gardens, pets, and kids. Hot Pepper Wax: Made from hot cayenne peppers, this firey liquid is safe to apply to fruits and vegetables as well as ornamentals and flowers. Not many products are good for edibles, so this product is unique in that since! It is great for plants inside pots as well. Deer Ban capsules: This urine filled capsules actually strengthen with moisture and last up to 90 days! Urine may not sound that appealing, but it is odorless to humans and safe to use around any plants or vegetables. They even work great around the edge of your property line, to keep deer from entering. The coyote urine concentrate that is contained in the capsules causes deer to fear the area and flee before damaging your plants. You may use them year round as well (provided they are not covered by inches of snowfall).